Meh... The chicken wasn't as crispy as I thought it would be, it kind of got soggy under the guac. The guac was spicy and tasty but the overall spice level rose to "Salty". I'll try again but would prbably order something different. The description of the Guadalajara describes a sandwich of delicious flavors that you won't find anywhere but here. However, it really is nothing more than a few salty chicken planks on a ciabatta bun with avocado and cheese. Overpriced for what was provided, I recommend trying something else instead of being drawn in by the fancy description for a basic sandwich. Found a big nasty hair in my sandwich. 'Nuff said but...I need to add a few more words to get the website to accept my review. I will NOT eat here again. The sliders were inspired. Better Kalua pork than in Hawaii, though surroundings aren't as nice... One of the best lunches I ever ate, and definitely the best thing I ever ordered from a food truck. Absolutely delicious bread, and the goodness in between the slices tasted wonderful, too. Nice combination of flavors--and a great, friendly first experience with the local food trucks. Fresh guacamole, salsa, veggies and meat ... excellently seasoned.... Tortuga is one of the wonders of the resaurants on wheels... simply excellent. The sandwich is great! The meat is seasoned well, the toppings are tasty and add to the flavors and the bread is really nice too. 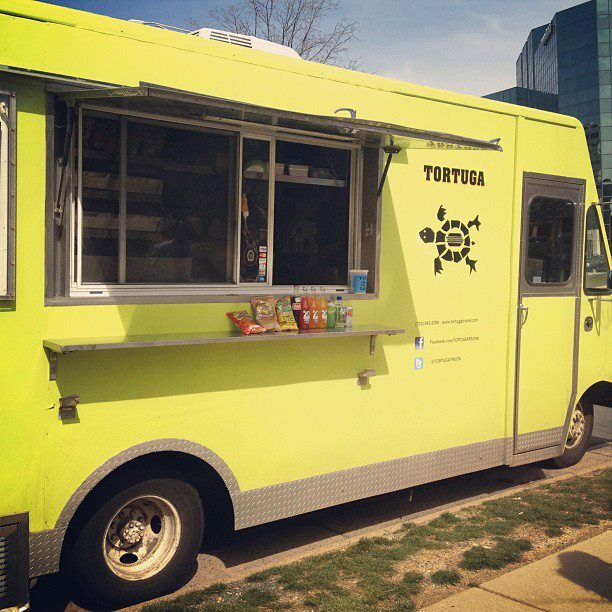 Serving tortas, sandwiches and more, Tortuga launched on June 28, 2011 in Fairfax County, VA. Their truck is a mind-blowing 23 feet long. Thus, it will not be able to serve in Arlington or DC because it exceeds the maximum regulated length in those municipalities. Cool and refreshing on a hot day. Our take on a famous Chilean salad. Thin sliced of crunchy celery and cucumber are tossed in a lemon vinaigrette and served on soft, dark German bread that has been spread with smashed avocado, goat cheese and walnut chimichurri. All about the exquisite, Spanish Serrano ham. Layers on thinly-sliced Jamon Serrano served on a warm, chapata roll that has been spread with freshly-grated tomato and a garlicy aioli. Topped with a salad of peppery arugula and a sharp, aged Manchego cheese. New and improved!!! Our take on the Argentine favorite “Choripan.” Seared Argentine chorizo served on a warm, French roll that has been spread with smashed avocado and chimichurri. Topped with pickled, red onions and hard-boiled egg. Sweet and tender shrimp, sautéed with shallots, chipotle and garlic. Served on a crusty, warm French roll and topped with a lime and red cabbage slaw and crispy tortilla strips. New and improved!!! Crispy, breaded chicken that has been tossed in a spicy chipotle broth. Served on a warm, buttered, Bollio roll & topped with smashed avocado, Chihuahua cheese, herb mayo, and an escabeche salad of pickled jalapenos, onion, carrot & cilantro. Our take on the famous Peruvian dish, Lomo Saltado and our most popular torta. Marinated skirt steak sautéed with peppers and onions, topped with freshly sliced tomato, aji amarillo aioli, queso fresco, parsley and crispy potato sticks.